From a bite sized russian tornado chip, to the huge 40cm tornado potatoes. Ever had a chipdog/Tater Dog? You can cut these potatoes into any length spiral. The standard spiral chips we sell in South Africa are with the 20cm bamboo skewers, any length skewer will work, as long as it is 5mm thick. 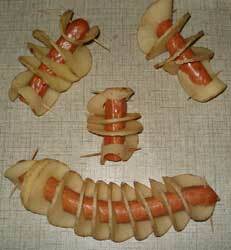 For a hungry client, with money to spend, the chipdog option is becoming the favourite. The photo on the left was taken from a South African TV journal program, where they've shown one of our 40cm tornadoes being eaten by a girl - the skewer as long as her arm. These commercial potato cutters cut the tornadoes on the skewers, so there is no need to transfer the potatoes after cutting a tornado potato into a twister shaped chip/money maker. 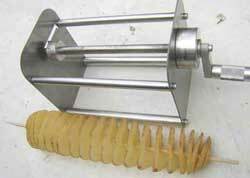 With a simple design, this potato tornado cutter can cut a potato with a 95mm diameter(or smaller), and of any length. That make for some serious potatoes, but you'll only need a small medium sized potato for a 20cm skewer. If you can find bigger skewers, go for it. Then you'll just need to look into getting a long enough deep fryer to accommodate that size skewer. Many of our clients use the small deep fryers that can be found at Game or Makro etc. They have a few of these electric deepfryers next to each other. With longer skewers, you'll need a bigger fryer. Chipdogs or Tater Dogs are the next big craze to hit the world. No more buns getting old as in Hotdogs, instead of a hotdog bun use a potato, then include a russian, frankfurter or sausage on the inside of the spiral cut potato? Basically, you cut the potato into a spiralled tornado, then remove the skewer and enlarge the hole in the centre of the potato. Once large enough, insert your choice of sausage and deep fry as normal. - So simple, it does take a little bit more time to prepare the uncooked chipdog - BUT you can charge more, and make more profit. And to make a Tornado Tater, just remove the skewer after cutting the potato, and deep fry the taters(Not to be confused with a butterfly tater). 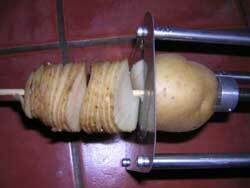 For your own stainless steel tornado potato cutter - business, pleasure or both? "For revolutionary food, one must hit the streets. At a stand in busy Myeongdong(Seoul, South Korea), I tried the tornado potato, a single spud carved into a helix of starch, then skewered, deep-fried and sprinkled with salt and powdered cheese..."
www.Tornado-Potato.co.za Last Update 7 April 2015.